WELCOME BACK. The scripture says: Give, and it shall be given unto you; good measure, pressed down, and shaken together, and running over, shall men give into your bosom….The secrets of living is in the principles of giving. Elizabeth Bibesco said: “Blessed are those who can give without remembering and take without forgetting”. Giving is always the indicator of your love for others. When you cease to make a contribution to your world, you cease to survive both spiritually and otherwise. Those who become getter never receive happiness, but those who give do. Turn on the tap of generosity. This principles is wonderful and amazing. You see, there is only a limited amount of what you can give away. Fortunately, generosity and kindness are not bound to these same material limitations. During my searched for destiny, I discover that one of the life’s most basic principles is “every single act of love, kindness and generosity will multiply and return to you many times over” The more you give the happier you will feel. Being generous is the best step to take, when you give quickly, it is like giving twice. When you give only after being asked, you have wasted too long. Whatever you give to someone is what comes back to you in direct proportions. It’s very simple. If you want to experience attention, love and happiness from other people, learn to give attention, love and happiness to other people. They are life precious gift that are effortlessly done without knowing. It’s a principle that can never be broken. For example. Meet people on your way and silently send them a blessing, wishing them happiness, joy and laughter. This kind of silent giving is very powerful. Do this, and you will suddenly find people around you opening to you in joy and happiness. Giving create a pattern of happiness, joy and love in your life beyond your wildest expectation. Dr Mike Murdock said “Giving is proof that you have conquer greed”. If you have the spirit of giving. You will not lack. People who give always receive. 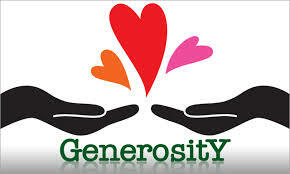 Remember, the test of generosity is not necessarily how much you give but how much you left. This entry was posted in success and tagged Consistent, Encouragement, Fulfillment, Habit, Imagination, improvement, Insight, Inspirational, Journey, Life, Passion, Persistence, Possibility, Potential, Principles, Spiritual, success, Successful, Talent, Understanding, Vision, Wisdom.